Rosie Smith, S3, came third in the regional final held in Inverness College on Wednesday. This was after winning the school heat and then winning the local heat in Inverness before Christmas. 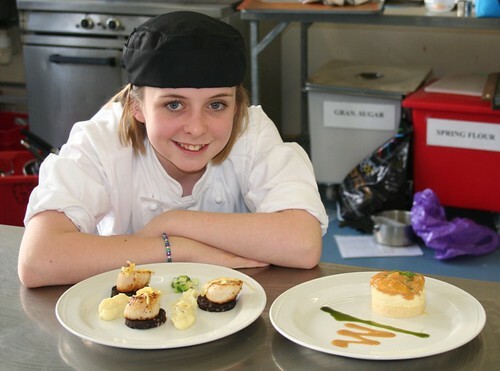 Rosie got support from many locals and would like to thank everyone that helped her with Future Chef 2009. Dan Hall, her Mentor Chef, from Poolhouse; Williamson’s Food Service for supplying a lovely set of chefs whites and most of the ingredients; Jane Grant from Isle Ewe for the scallops and Ritchie’s of Aultbea for the black pudding in particular. Thanks to Rosie’s mum for the photos.